Jason Ice was born in San Antonio, Texas in 1977 and currently lives and works in Austin, Texas. He graduated from the Art Institute of Dallas in 1999 with a degree in graphic design. Working for a decade as a product designer as the lead for Diesel Timeframes allowed him to mature as a designer which influenced his work as an artist. Jason began to show his work in group shows as a creative outlet from the life as a corporate artist and began to flourish in the Dallas art scene. It has been one year since Jason moved from Dallas to Austin. The goal for him was to refocus as a person and artist. He was looking for the opportunity to evolve and evaluate his work in a new mindset. When Jason first came onto the scene he was known for his street art style and heavy use of spray paint. He is proud that the new collection of work has extremely limited use of spray paint and how it is evolving. 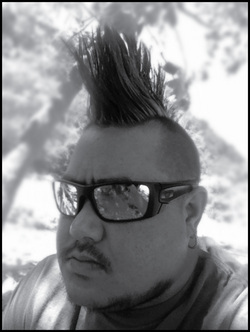 He has most recently had a solo exhibition at La Reyna, Austin (2011) for the first annual South First Art Walk and is a featured guest artist at the Austin Raw events where he performs live painting demos at the monthly showcases.